On Wednesday morning, the PNG U16 Binatangs flew out of Jacksons International Airport in Port Moresby, bound for Brisbane. The task ahead, taking on the challenge of the Under 16 QLD state championships. The first round has been played and the Papua New Guinean boys have already had a win. 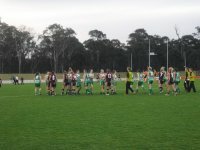 First round of matches between South Eastern Bushrangers, Suncoast Power, Gold Coast Stingrays, Western Taipans, Country Kookaburras, Northern Raiders, AFL Q Colts and the PNG Binatangs. Friday April 29 being a rehab day. 1st playoff : Winner Game 7 vs Winner Game 8. The coach of the Coca Cola Binatangs, Mr. Nathan Napkai was excited about the prospect of pitting his squad, many of whom have been training at the De La Salle College in Bomana through the year, against the best under 16s in Queensland. AFL PNG Academy student Eddie Meli was judged best on ground, others amongst the best included Scott Johnson, Major Alphonse, Max Lavai and Junior Francis. Johnson kicked 3 goals.